Starmobile stepped up to another level of smartphone technology features, from their last series of quad core phone release they are now cooking for an octa core (8-core processor) powered Android phone. From their series of teaser photos on Happy Man's facebook, they revealed this very first octa core phone in Philippines local brand dubbed as Starmobile Diamond X1. A phablet size Android Jellybean phone in 6-inch screen size that comes with IPS HD display. As posted on their FB photo flyer, it has 18 megapixels rear camera and 8 megapixels for front facing cam. With this kind of written package, I'm sure this is what everyone wants to have for a smartphone. You can take good quality photos without bringing along your SLR camera and even in low light you can still take a pic with the help of BSI sensor feature. The internals of X1 are very impressive, an octa core processor clocked at 1.7GHz paired with 2GB RAM and 8GB internal storage that can expanded up to 32GB using external memory card. 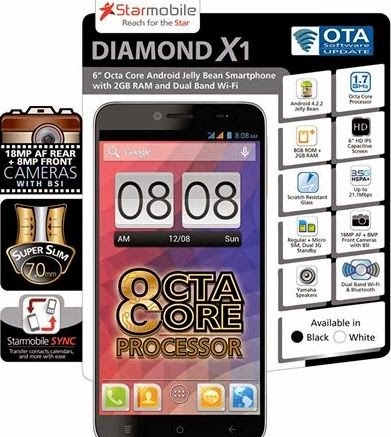 As claimed by Starmobile, Diamond X1 runs on true octa core chip meaning all this 8 processor can together at the same time. Supaah fast right? So if you're sicked when your current phone processing power, then you need this one. By just looking at the specs sheet above, I'm sure you had some questions in mind like 'How much is the price? ', 'When is the release date or availability? ', 'Can this be upgraded to Android 4.4 Kitkat OS?' and more. All of our question in mind will be answered once Starmobile officially announced it, as per Happy Man you can stay tuned to their FB page for the latest announcements. One thing to watch out on this phone is the battery power, hopefully they will bundle it with higher mAh since it has more processor running and in HD screen but all in all everything is good. If you’re willing to wait for another local brand octa core phone for comparison purpose, let’s just watch out if what MyPhone and Cherry Mobile can offer octa core phones.